June 15, 2015 – Now within one month of the historic Pluto flyby, NASA’s New Horizons team has executed a small but important course correction for the spacecraft, completed updated analyses of possible hazards in the Pluto system, and is picking up the pace of science-data collection. A 45-second thruster burst on June 14 refined New Horizons’ trajectory toward Pluto, targeting the optimal aim point for the spacecraft’s flight through the Pluto system. This was only the second targeting maneuver of New Horizons’ approach to Pluto; Sunday’s burst adjusted the spacecraft’s velocity by just 52 centimeters per second, aiming it toward the desired close-approach target point approximately 7,750 miles above Pluto’s surface. The maneuver was based on the latest radio tracking data on the spacecraft and range-to-Pluto measurements made by optical-navigation imaging of the Pluto system taken by New Horizons in recent weeks. Using commands transmitted to the spacecraft on June 12-13, the thrusters began firing at 12:05 a.m. EDT and stopped 45 seconds later. Telemetry indicating the spacecraft was healthy and that the maneuver performed accurately reached the New Horizons Mission Operations Center at the Johns Hopkins University Applied Physics Laboratory in Laurel, Maryland, through NASA’s Deep Space Network at 6:23 a.m. EDT. With the spacecraft nearly 2.95 billion miles from home, the radio transmissions from its communications system need nearly 4.5 hours to reach Earth. Mark Holdridge, New Horizons encounter mission manager at APL, said that without the maneuver, the spacecraft was on a line to arrive about 470 miles (755 kilometers) away from the aim point at Pluto, some 84 seconds earlier than desired. The New Horizons team will continue to analyze spacecraft navigation and tracking data with an eye on June 24, which would be the next opportunity for them to adjust course. New Horizons is now less than 22 million miles from the Pluto system, or less than 100 times as far from Pluto as the moon is from Earth. The spacecraft is healthy and all systems are operating normally. Approach science operations resume today. Planning for a daring close approach that will take its spacecraft inside the orbits of all five of Pluto’s known moons, the New Horizons team has completed its analysis of the second and third sets of hazard-search observations of the Pluto system. The data were taken May 29-30 and June 5, using the telescopic Long-Range Reconnaissance Imager (LORRI) camera on New Horizons. For these observations, LORRI is commanded to take hundreds of long-exposure (10-second) images, which are combined to enable a highly sensitive search for faint satellites, rings or dust-sheets in the system. All elements of the process went well, including the observations, the downlink of the images, the resulting data reductions, and the search for new moons or rings that might present hazards to the fast-moving New Horizons spacecraft when it flies through the Pluto system on July 14. The latest hazard observations easily detected Pluto and all five known moons, but no rings, new moons, or hazards of any kind were found. The New Horizons hazard detection team determined that satellites as faint as about four times dimmer than Pluto’s faintest known moon, Styx, would have been seen if they existed beyond the orbit of Pluto’s largest and closest moon, Charon. Limits on possible rings are unchanged since the first hazard observations in May: any undiscovered rings must be very faint or narrow – less than 1,000 miles wide or reflecting less than one 5-millionth of the incoming sunlight. The next New Horizons hazard search will start June 15, and the team will report on the results on approximately June 25, after completing a detailed analysis of the new and still more sensitive data. In the last week of June, the Pluto approach enters its third and final far encounter science phase—called Approach Phase 3, which runs until seven days before Pluto close approach. “AP3” highlights include taking additional images of the Pluto system for final navigation purposes; mapping Pluto and Charon in increasing detail and watching for variability in color, surface composition and atmospheric patterns as the small planets rotate; and searching for new moon and rings with even greater sensitivity. New Horizons will also continue sampling of the interplanetary environment – measuring both solar wind and high-energy particles, as well as dust-particle concentrations – approaching Pluto and its moons. 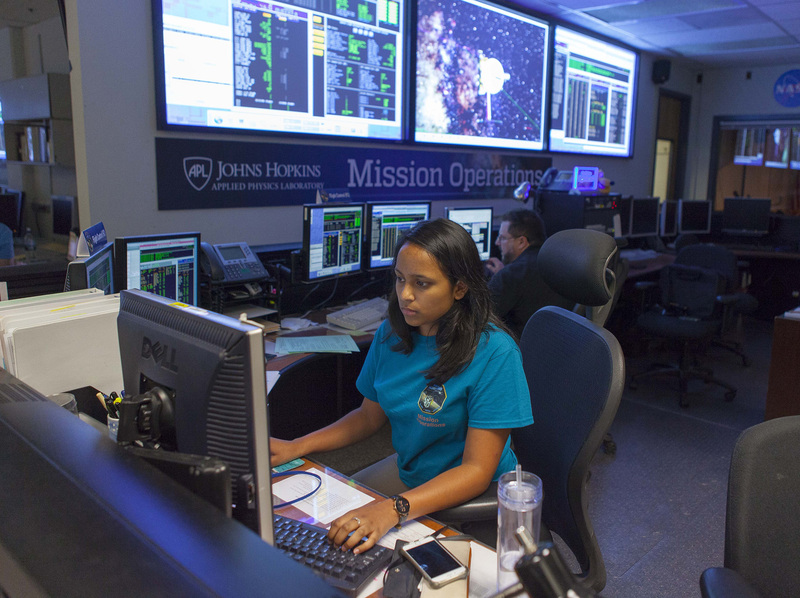 The Johns Hopkins University Applied Physics Laboratory in Laurel, Maryland, designed, built, and operates the New Horizons spacecraft, and manages the mission for NASA’s Science Mission Directorate. The Southwest Research Institute, based in San Antonio, leads the science team, payload operations and encounter science planning. New Horizons is part of the New Frontiers Program managed by NASA’s Marshall Space Flight Center in Huntsville, Alabama.